Disclosure of material connection- I received a copy of the book from the publisher via Netgalley in exchange for my honest thoughts. I was not required to write a positive review and all opinions stated are 100% my own. Sweet sixteen and never been kissed—and that’s the way Aurora Skye wants it to be. She’s too busy finding guys for her two best friends, counseling her sensitive New Age dad (the NAD), and dealing with the unexpected return of her long-absent mom. But always in the background there’s Hayden Paris, the boy next door, the bane of Aurora’s existence. Smart, funny, and always around to see her at her worst, he ‘gets’ her like no-one else... and that’s what makes him so infuriating. 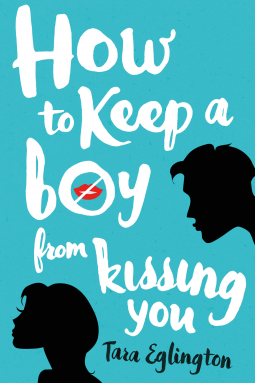 From talented debut YA author Tara Eglington, How to Keep a Boy from Kissing You is a page-turning, funny and delicious romp of a book. This book was so cute! It reminded me of a relationship I had in high school, even down to the theater part of it, although we were building sets instead of portraying the main characters in a Shakespeare play. I think Hayden may be my new book crush! He does so many swoonworthy things! Hayden seems to be the type of guy any girl would want to be with, it just takes Aurora ages to come to that conclusion. I feel bad for Hayden throughout most of the book, but he does a great job navigating the crazy Aurora waters. I found that I really disliked some of the other characters in the book, but I am sure that is what the author was going for. I always think a sign of great writing is strong feelings for a character, whether positive or negative. Throughout the book I wanted to scream at Aurora to open her eyes to Hayden's feelings and his obvious hints at them, but her oblivion did lead to an epic final scene. I absolutely loved the way the book ended and was thrilled to see that there is a second book because I would really love to see what's next in Aurora's story! I would recommend this book to anyone who enjoys YA or who is a romantic at heart that loves a good love story.